22/190 Max Braden Despicable Me's minions were better, but I liked Megamind more. And the long distances shots were amazing. 72/123 David Mumpower I would have enjoyed this so much more if 1) it hadn't totally ripped off Dr. Horrible and 2) they had cast anyone but Jonah Hill. At least you know what you’re getting with DreamWorks Animation: solid (if unspectacular) CGI, a rotating slate of A-list (in name, at least) voice talent, mostly hearty (sometimes cheap) laughs and recently - a slate of surefire blockbusters. This is, after all, the studio that foisted Shrek (they keep reminding us), Shark Tale and Madagascar upon unsuspecting audiences. And to be fair, all the above titles were mostly entertaining and, to say the least, financially successful. But there’s always been something missing. Something that DreamWorks hasn’t been able to conjure up yet even though it has attempted to grasp for it (unlike Blue Sky Studios) - that old fashioned Pixar magic. You know the type. It’s been present ever since the first Toy Story (and hopefully can stick around for one more sequel): that sense of discovery, simple wonder and - now that I think about it - large helpings of heartfelt nostalgia. In no Pixar flick was this more evident than The Incredibles. Sure, we’ve seen plenty of fading-superhero-tackles-one-last-villain-before-he-rides-off-into-the-sunset plotlines but this one was more than that: it recalled golden age of the chiseled, square-jawed hero’s and villains without bogging down the plot in worshipful flotsam (see: Superman Returns). Leave it to DreamWorks to subvert this storyline (but probably sell just as many children’s action figurines) with its latest CGI blockbuster in the making, Megamind (formerly the unfortunately titled Oobermind). Directed by the ever-reliable Tom McGrath, co-helmer of the Madagascar flicks, the animated tent-pole looks - on paper - like the strongest release of what should cap a very good 2010 for the animation studio. 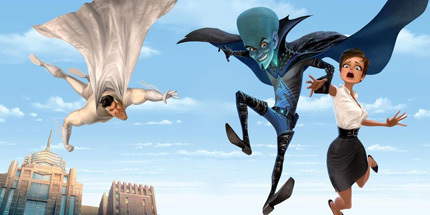 One thing is for certain about Megamind: the plot, which revolves around a super-villain who has mistakenly vanquished his arch-enemy and now has nothing to do, will not be treated with the same reverence as it would if it were in Pixar’s stable. And maybe that’s a good thing. DreamWorks animation, unlike the ever-earnest Pixar, seems to be at its best when it deals irreverently with its subject material - think back to the tossed off throw away gags in Shark Tale and Shrek sequels. See the latest developments for this project on the Megamind Movie News page.